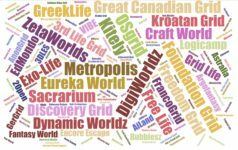 While most OpenSim hosting companies are cautiously optimistic about the new Gloebit currency, currently in beta testing on Hyperica and ZetaWorld grids, grid owners themselves are split on how they want to see payments evolve. 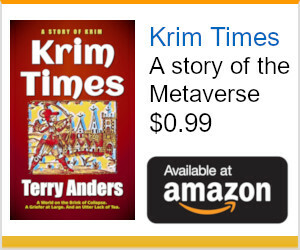 Dreamland Metaverse was one of the early testers of the Gloebit currency. Brunner pointed to the fact that the balance doesn’t always upgrade automatically in the viewer, which Gloebit CEO Christopher Colosi has already said he’s working on. He’d also like to see the “Buy Currency” button working better than it is now. 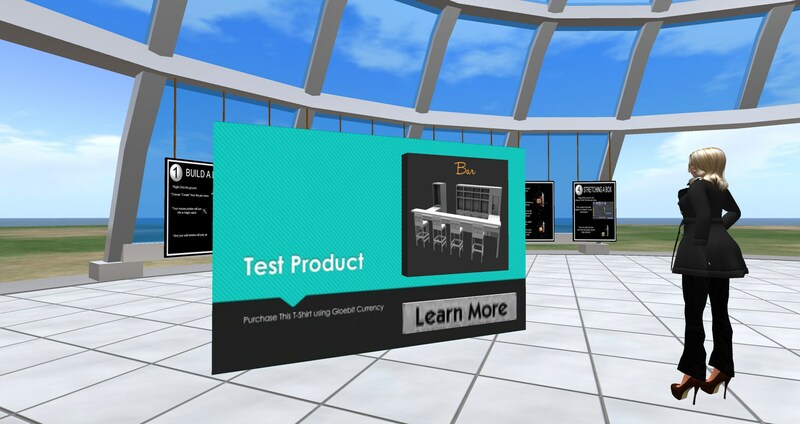 Dreamland Metaverse set up a test of the Gloebit virtual currency on the Hyperica grid. Further tests are also needed for grids that run different currencies on different regions and on the hypergrid, he said. “An additional security review would also be good,” he said. Dreamland will be offering Gloebit as one of its supported money solutions as soon as it is ready, he said. ZetaWorlds is testing the Gloebit currency on the Gloebit 1 and Gloebit 2 regions. Elsewhere, the grid continues to use OMC. Here I used the account I had previously used for shopping on Hyperica to buy a bar. Zetamex Network is also testing the Gloebit currency. Interested users can teleport to hg.zetaworlds.com:80:Gloebits 1 and hg.zetaworlds.com:80:Gloebits 2 to try it out. The hosting company DS4O currently only offers Podex to its OpenSim grid customers who need grid currencies and is waiting to see how well Gloebit takes off. 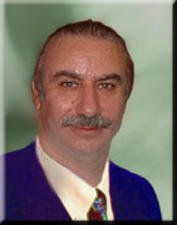 “It is something that OpenSim has needed for a long time,” DS4O spokesperson Cloneu Inglewood told Hypergrid Business. DS4O has previously also offered the OMC currency from Virwox, but has seen problems. DS4O stopped supporting OMC long ago, Inglewood said, and would not consider using it again. 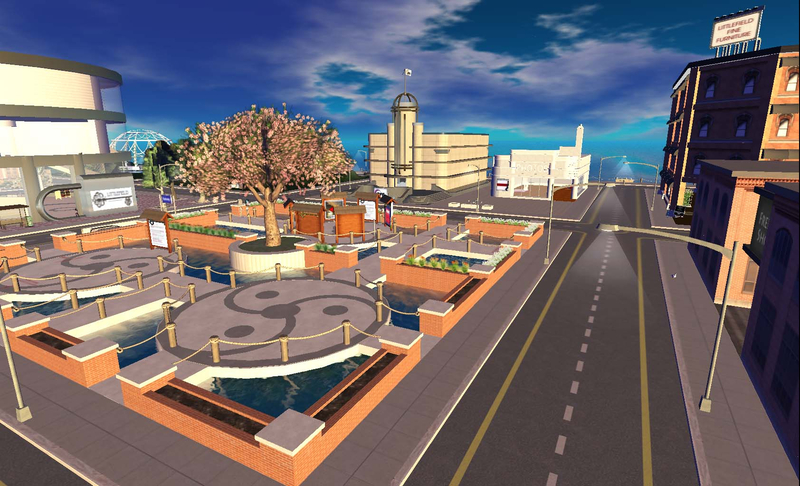 The DigiWorldz grid has been in contact with Gloebit “for some time,” DigiWorldz founder Terry Ford told Hypergrid Business. He is currently waiting to see that it performs well, with solid infrastructure, good support, and regular updates. He added that the fees seem more reasonable than those of Podex. DigiWorldz also provides hosting and technology services to other grids, including minigrids and standalones, and larger commercial grids including 3rd Rock Grid and The Great Canadian Grid. The French-language, hypergrid-enabled SirinHGpole grid is also open to experimenting with Gloebits. Grid owner Sirin Peccable told Hypergrid Business that the hypergrid needs a new payment system, and that Gloebits are a great idea. “I have created a account on Gloebit and I would like install the currency system on my grid,” Peccable said. The Gloebit platform has great potential, Farworldz grid owner Talla Adam told Hypergrid Business. 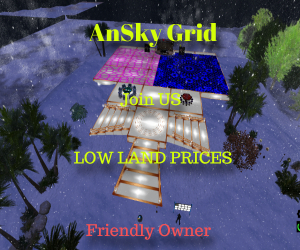 A common currency can help create a single market across the entire hypergrid, she added. While many OpenSim grids embrace commerce and look for ways to grow their economy, others work on a volunteer or donation-only basis. The latter include the 2Open grid, Littlefield, and many of the non-profit grids. He said that prefers to see grid supported by donations instead of in-world commerce. “I don’t like currency and we don’t and never will have it in Littlefield,” grid owner Water Balazic told Hypergrid Business. Other grids prefer to stick with a currency that’s fully under their own control. Unlike the OMC and Gloebit, Kitely’s own currency, Kitely Credits is not redeemable — people can only use it for in-world purchases, and to pay for Kitely land and other services. 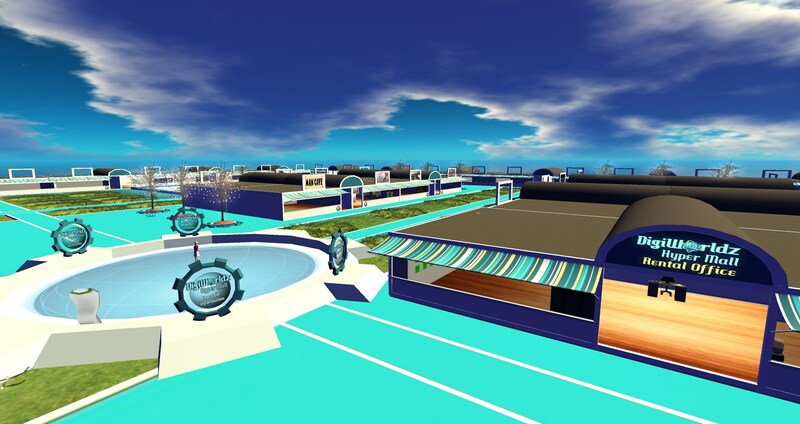 One of the Kitely Market stores offering exportable content delivered to more than 120 OpenSim grids. 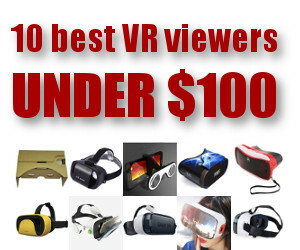 Kitely merchants who would like to cash out their earnings already have an option, he said — they can list their Kitely Market products for sale in US dollars instead of Kitely Credits. 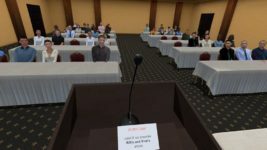 Gloebit might also have a disadvantage for some grids because it is based in the U.S.
“It does not pose a threat to Virwox and the OMC because this US-registered virtual currency is close to impossible to implement for a commercial grid in Europe,” Xmir grid founder Geir Nøklebye told Hypergrid Business. Nøklebye said that the only universal currency he can see working on the hypergrid is a cryto currency such as Bitcoin. Per Eriksson’s Troppo Club grid. Bitcoin is an open source, peer-to-peer currency, that has been steadily growing in transaction volumes in recent years, though its price is still very volatile. “Bitcoin is a solid system and offers minimal cost per transactions,” he said. Currently, only casino-themed YrGrid is using a Bitcoin-based currency. YrGrid, in particular, would not switch, she said. Using off-the-shelf Bitcoin is problematic, she admitted, because of the time it takes to confirm transactions. Other grids that accept Bitcoin typically just set up a local virtual currency and accept Bitcoin payments. 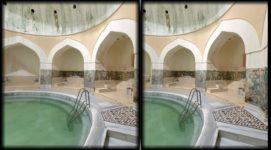 YrGrid, instead, uses a different system. 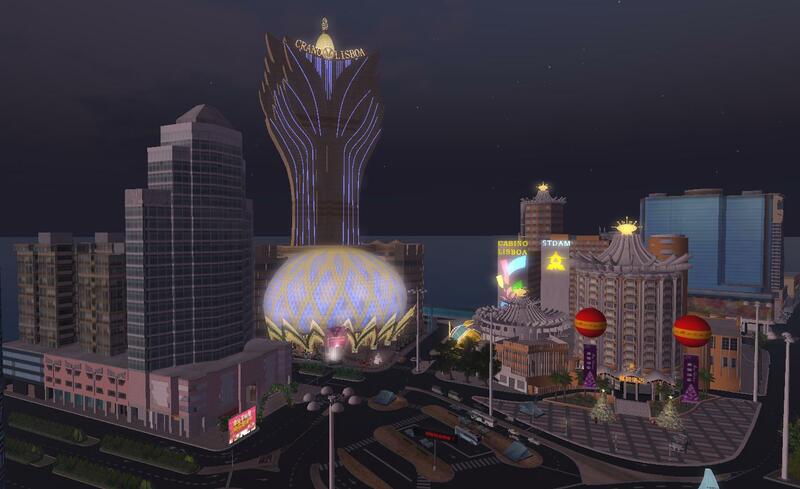 YrGrid’s Welcome Center region is a recreation of the gambling district in Macau. 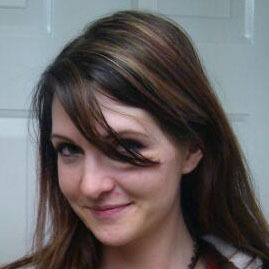 The Adult Grid will also be sticking with its own currency, grid co-founder Constanza Amsterdam told Hypergrid Business. “I think most grids will want to hold it in their own control,” she said, adding that Podex, which her grid users as its currency exchange, has been around for a while and has proven its worth. 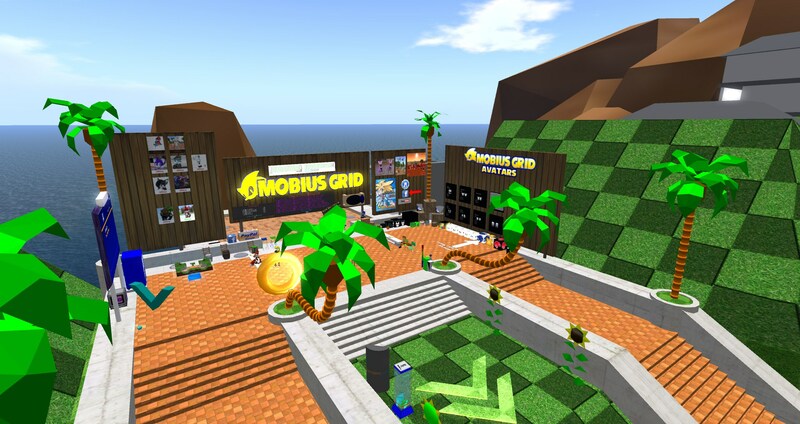 Green Hill Zone region on Mobius Grid. And Mobius grid is sticking with the OMC currency, even despite Virwox’s recent decision to stop supporting New York users. Corr added that he’d be interested in seeing Bitcoin, as well, but is worried that it would be too slow for most users. One difference between the OMC and Gloebits is that OMC requires a web-based confirmation for every transaction, while Gloebit requires that confirmation step only when the user is shopping on a new grid for the first time, or is setting up a recurring payment. 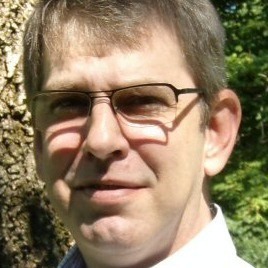 “My user base, oddly, likes the extra web step in OMC,” said Corr. CloudServe is the other major OpenSim hosting company, but the company already offers its own multi-grid currency, called Game Tokens. 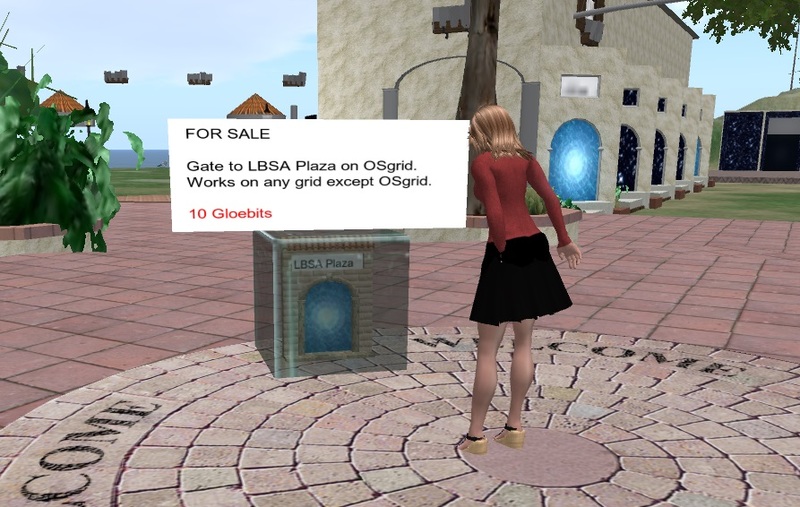 Like Gloebits, Game Tokens are supposed to work on the hypergrid, and offer commissions to grid owners, and is also available outside of OpenSim. 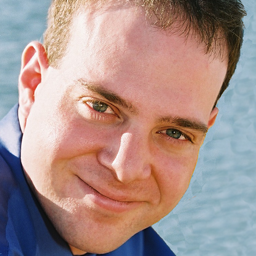 “We do offer it to our CloudServe clients, as well as real life clients,” chief technology officer Frank Corsi told Hypergrid Business. “A centralized system is far better overall,” he added, in response to critics who would prefer a more peer-to-peer, decentralized platform like Bitcoin. 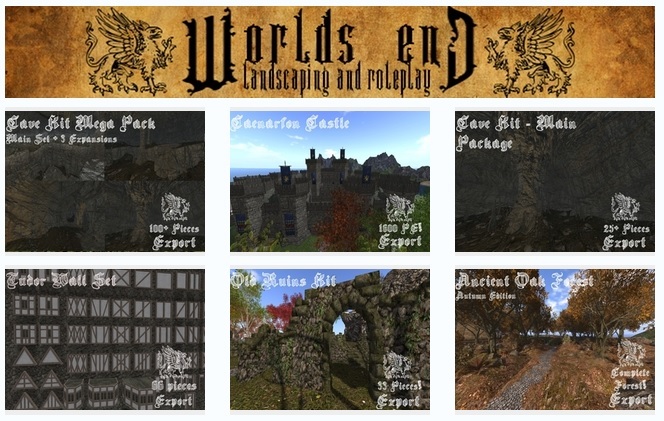 Currently, Game Tokens are used by the hypergrid-enabled Atek Grid, and on Side Kicks, Archer Place, Virtual World City, Southern Virtual Land, The Mightly Ginkgo, Galaxy Grid, and New Life Destination. Corsi said that his platform is listed with FinCen, the U.S. financial regulatory agency, and banks with a national bank in order to be able to provide a regulated currency legal in the U.S. 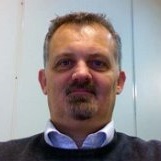 But Corsi said that CloudServe is open to setting up other payment systems for its grid customers. “We always give the customers what they ask for,” he said. And he’s open to other types of relationships, as well.